Cleaning under an angle. Developed by professional window cleaners for cleaning glass surfaces out of reach. Balustrade backside glass surfaces can be safely cleaned without securing the traffic area at lower levels. Large areas can be achieved using the swiveled handle and squeegee with pre-impregnated damp UMF cloths and wearing the Rekola Addon buckle belt with EVA pouches. The securing line on the handle secures to the belt, preventing any risk of utensils or spillages dropping down on people on lower levels. With this tool the job becomes a one person operated activity without the need for platforms, safety rigging or platforms. And no need to secure a cleared zone below the cleaning area. Glass or and sealed hard top balustrades or similar for safe cleaning results: e.g. shopping malls, auditoria, public building, etc. 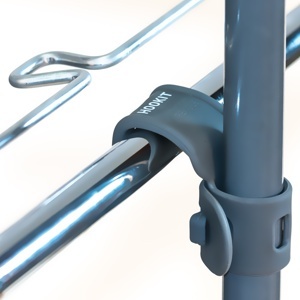 The Rekola Reflex Extendable handle with swivel has a flexible height adjustable turn-lock. By adapting the Rekola Reflex Extendable handle in length and securing the safety-line to operator’s belt, the tool can be operated safely with a damp UMF cloth to clean the backside of the balustrade wiping up and down. Right handed users*: The Rekola Reflex squeegee together with the Rekola Reflex extendable handle with swivel forms an ergonomic utensil for cleaning in lap mode. 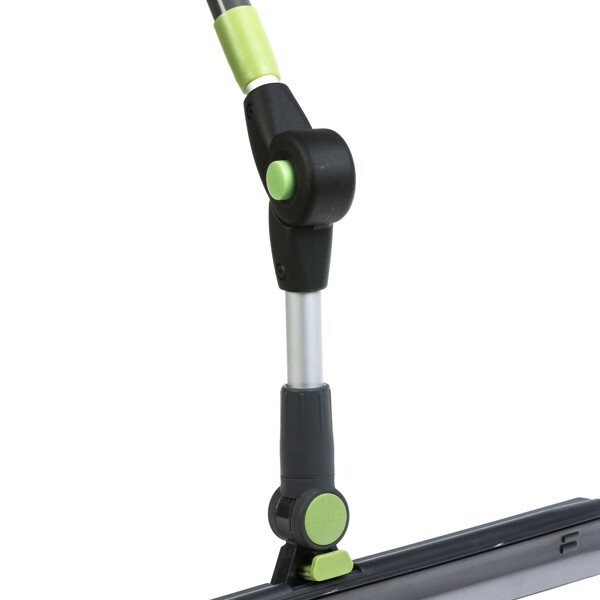 Unscrew the collar from the Rekola Reflex squeegee and slide on to the handle with swivel. Bend lid backwards so that the handle can penetrate into the swivel. Observe the position, that the blocker inside the swivel slides into the cap of the handle. Release lid and turn collar firmly back on the squeegee. Adjust the swivel to the optimal working angle after the cloth is mounted. *Left handed users – follow same method but reverse right and left. Because of the angle of the swivel the operator does not need to bend over the balustrade but can clean with a straightened back, no risk of losing their balance. The supplied security line to the handle makes sure nothing will drop down when connected to the operator. We recommend cleaning the tool after use and before being stored..
Rekola Reflex extendable handle with swivel is made of aluminium and synthetics; and made out of virgin materials: may be used for recycling programs. The extendable feature of the Rekola Reflex handle with swivel, makes it possible to reach out to lower distances without demounting.